For whatever reason, people often donate things that are really not useable rather than throw them away themselves. One day I asked LaVaughn, the thrift shop manager, if I could go through the unwearable Tees and buy them for cheap. Well, I wasn't prepared for how cheap! 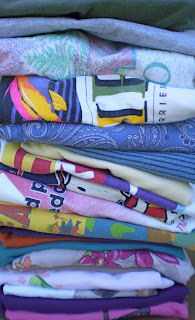 I paid $1.00 for 6 pounds and 4 ounces of 100% cotton T-shirts, thus saving them from the landfill! You ask, what will you do with those unwearables? I bring them home, wash them and sanitize them (using a chemical-free method the EPA recommends), and then I cut around the stains and holes and use the beautiful cotton fabric to make wrist cuff wallets. I had to stop by and share that I have one of Mary's awesome wristbands. Frankly, I too am a tShirt-aholic but that's another story.... what she's made in this wristband is quality, creative and I am glad to have crossed paths with her. Basically, you rock Mary! Yup!